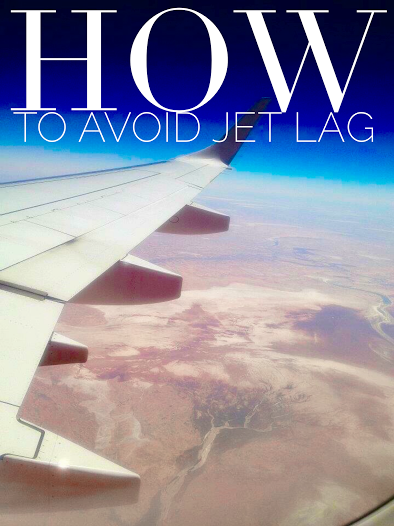 How To Avoid Jet Lag: Tips From A Full-Time Traveller! Jet Lag is probably the most dreaded part of long distance travel. Crossing time zones can have a remarkable effect on your natural body clock and in turn can cause fatigue, disorientation, indigestion, inability to sleep and to make you feel a bit crappy in general. Studies show that it takes approximately a day per time-zone crossed to fully recover from jet lag. As a seasoned traveler who catches far too many planes I have learnt a few tricks on how to avoid let lag, in fact I almost never get it. Here are some suggestions on how to avoid jet lag! 17 TIPS TO PREVENT JET LAG! The saying goes that ‘West is best and East is a beast,’ so how you approach your jet lag preparation is crucial to which direction you are flying towards. A few days before your flight start changing your sleeping and eating patterns to suit your direction of travels. If you are heading east go to bed an hour earlier the week before your flight and if you are heading west go to bed an hour later. Studies have shown that those who have set sleeping and eating routines find it harder to adapt to new time zones whilst those with flexible schedules find it easier. Once on the plane change your watch and phone to the time-zone of your arrival destination. Now the times have been changed accordingly eat and sleep according to the time of your arrival destination. Take an eye mask, inflatable pillow and ear-plugs with you to make this process easier. Resist the urge to indulge in the free alcohol and coffee that often come on flights and stick to drinking water, and a lot of it. The dry air of an aeroplane dehydrates you enough let alone the challenge your body faces on changing time-zones, so ensure you keep yourself well hydrated with good old water (whilst alcohol may put you to sleep initially the alcohol induced sleep won’t be deep enough to rest you at all so will make your jet lag worse – avoid it at all costs)! Don’t eat processed or sugar-filled foods, your bowels will suffer enough. Stick to fresh vegetables, fruit and protein. I suggest packing a few snacks of your own so that you can avoid the sodium-rich airplane food as much as possible and so you can create your own eating schedule. If it’s possible, try to work a stopover into your travels so that you can break up the long flight and make the time-zone changes easier on your body. Make sure that whilst on the flight you stretch and move your body so that you feel less stiff and lethargic. Another important reason to stretch and keep your blood moving is to avoid a DVT/Blood Clot, a risk heightened from long bouts of airplane travel. Try to book a flight that arrives in the morning, it is easier to have a longer day than a shorter day. Once you have arrived have a quick, cool shower and go for a run or a brisk walk, preferably outside in the sunshine and fresh air. Not only is it a great way to see your new destination but the daylight and fresh air revitalises and awakens you after a long flight. Eat a protein rich breakfast/snack to stimulate the bodies active cycle. Don’t nap on arrival, stay awake until at least 9pm at your destination timezone. For dinner have some carbohydrates and not as much meat to stimulate sleep. Taking Melatonin, a natural sleep inducing vitamin, thirty minutes before your desired new bed time is a trick of air-hostesses world-wide (optional). Have a warm shower, moisturise the body (as the skin will be super dry from the flight and massage relies your muscles) and drink chamomile tea before bed. Make sure that the room is dark and avoid watching television or using your phone at least thirty minutes before it’s time to snooze. Also, try lying on the bed with your legs against a wall and practice deep breathing for a few minutes before bed – it works magic! Wake up at a normal time the following morning, even if you are still tired. Open the curtains and the windows to awaken your senses and drink lots of water! Also check out this awesome app, JetLag Rooster where you set your flight details so it can advise you on what time you should wake and sleep either after arrival, on the flight or from three days before departure. Genius! There you have it, these are my seventeen tried and tested tips on how to avoid jet lag so that you can spend more time exploring and less time sleeping on your next overseas adventures! Will you try these out next time you fly? Do you have tips of your own to add? this blog with your travel loving friends!